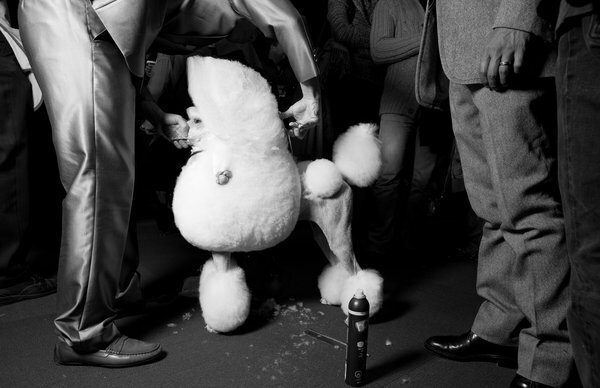 We thought this article in today's online version of The New York Times shed an interesting light on the behind the scenes work (and money) that goes into showing dogs, especially those canines and their humans that make it to Westminster. The campaigning, often compared to the "wave of advertisements and screenings before the Academy Awards", can cost tens of thousands of dollars and involve "multicity tours and splashy spreads in trade publications." Who knew that a full page add on the inside cover of a trade publication like Dog News costs $1800? But the article takes great pains to stress that some owners spend "next to nothing" on their campaigns, and according to the Westminster judges interviewed, "From a judging point of view, it makes no difference...your job is to judge the dogs as you see them that day..."
Of course, that's what the studios, directors, producers and actors say too-that the final voting is strictly on the merits. What do you think? Meanwhile, back at the ranch in Ohio...how do you think I'd go over in a "trade publication"?